Yen Bai, Vietnam, May 11th 2018 – In line with a company-wide commitment to support the growth and development of the community. In Vietnam, Canon Marketing Vietnam today handed over the Ba Khuy Campus of Na Hau Elementary and Secondary School located in the Van Yen District of Yen Bai; and the Ban Ke Campus in Quang Binh's Tuyen Hoa District. Na Hau Elementary and Secondary School, which is based in the Na Hau Commune, was the last of the 27 communes in the district to receive solid classrooms in which to educate its pupils. The school offers 27 classes for kindergarten, elementary and secondary students, but has only 15 classrooms in which do so. Of those, four were dilapidated chalets which date to 1991, and three steel frame classrooms that were built in 1994 and were also in need of upgrading. Another eight rooms were added in a steel-frame construction in 2016. 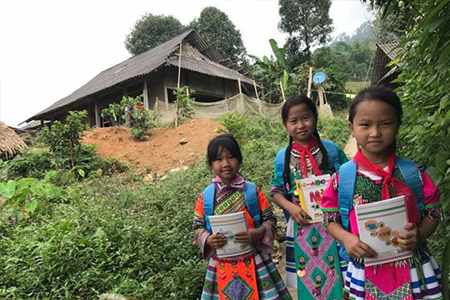 The Ba Khuy campus fortified and added to these structures as part of the 450 million VND sponsorship Canon has put forward to serve the 92 students in the kindergarten and elementary programs. Mr. Hiroshi Yokota, CEO of Canon Marketing Vietnam, said: "Lending a hand to create a better environment for students to learn, develop and prosper is one of our top priorities at Canon. I am thrilled to see these beautiful students and their hard-working teachers have a better place to study, grow and play. I hope that our contribution here helps them all fulfill their dreams." Expressing his gratitude to the company, Na Hau principal Le Ma Luong said: "With two new classrooms supplied by Canon Marketing Vietnam, our students will have better study conditions every day at school. On behalf of our students and faculty, I would like to thank Canon for coming and lending a hand to the students of Na Hau School." Singled out for extra assistance by the company was H’Mong student Vang Thi Hien. Hien grew up without a father, and her mother’s work forces her to be frequently away from home, leaving her with her two brothers in one of the poorest areas of the village. To help the family along, Canon also offered additional gifts and support her study. Meanwhile, in Quang Binh, the Lam Hoa commune's Ban Ke campus was also presented with a host of new facilities and amenities comprising an investment totaling over VND 300 million. Canon Marketing Vietnam’s support built an additional classroom, repaired existing classrooms, and built a new toilet for the students. It will be handed over in June. Mr. Vo Van Bang, principal of Ban Ke school, shared: "This meaningful support from our friends at Canon Marketing Vietnam is highly appreciated and provides the encouragement that staff and students at our school need to teach, learn and ultimately excel. We hope that Canon can continue its philanthropic efforts around the country in future." 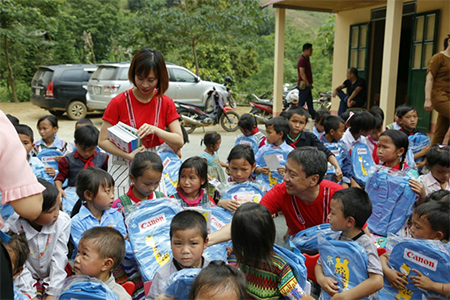 Thus far, Canon has assisted 55 other schools, building 77 classrooms, 12 toilets with hand sinks and 240 bicycles to students around Vietnam. These total an investment of around 5 billion VND so far. Canon is a global leader in photographic and digital imaging solutions. Canon Singapore Pte. Ltd. is the headquarters for South & Southeast Asia driving sales, marketing and service strategies. Besides handling the domestic market, the company leads 18 other countries including subsidiaries in India, Malaysia, Thailand and Vietnam. The parent company Canon Inc. has a global network of close to 300 companies and employs close to 200,000 people worldwide. It is dedicated to the advancement in technology and innovation and commits more than 8% of its total revenue each year to R&D. Canon is consistently one of the top few companies to earn the most number of patents over the last 20 years. As a Fortune Global 500 company, Canon is guided by its kyosei philosophy that focuses on living and working together for the common good. ABOUT CANON MARKETING VIETNAM CO. LTD.
Canon products have been available in Vietnam since the 1980s through its authorized distributors. In the last fifteen years, it established a more significant presence when it set up four production facilities in Thang Long - Hanoi, Que Vo and Tien Son - Bac Ninh, Pho Noi - Hung Yen and Canon Marketing Vietnam Co. Ltd. 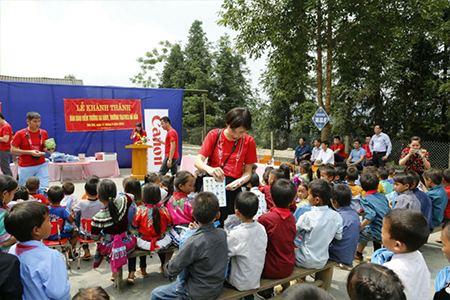 Besides providing employment for more than 22,000 people, Canon also makes outstanding contributions to the country's development through its meaningful social activities. Canon Marketing Vietnam Co. Ltd operates under the guidance and support of Canon Asia Marketing Group and Canon Singapore Pte. Ltd., which is the regional marketing headquarter for Canon's South & Southeast Asia region. Along with the distributor Le Bao Minh, Canon has more than 200 authorized service partners in the country. For more information, please visit www.canon.com.vn. Copyright © 2019 Canon Marketing Vietnam Company Ltd. All Rights Reserved.